< Previous Sweet Earnestine Found a Furever Home! Last night – before bed – I went on my WP app on my iPad and your post popped up – I was so touched. 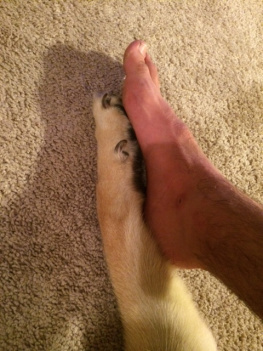 It just so happens that the owner of the foot was sitting next to me – and the paw, of course – Peyton was so moved by it. Thank you so much for the reblog and the amazing surprise and for bringing such a warm and loving smile to our faces and hearts. It shouldn’t have been a surprise 🙂 I told you I would post it “today” (i.e. Sunday). I don’t know where WordPress time clock comes from… their days and hours are completely different than mine so things never post when I expect them too. This did post about 6 hours early. Glad you got to see it right away! And, thank you for being a Sunday Caller! Keep inspiring!